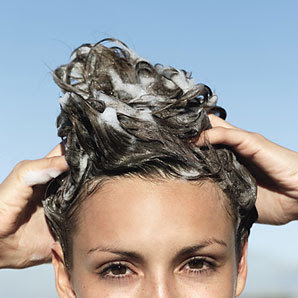 Using massage techniques whilst shampooing and conditioning means a healthy scalp, good blood circulation and a relaxed you. This is the beginning of the shampoo, meaning you apply the product using the effleurage technique. You need to move your fingers in a slow manner, stroking the product on the scalp. Then move your hands down in a firm motion along the contours of your head, to the nape of your neck. This helps relieve tension and relax muscles. The next stage of the shampoo is petrissage which is a kneading motion. With your fingers well spread out on the scalp begin to knead slowly but firmly, move your right hand clockwise, and your left hand anticlockwise. Rather than sliding the fingers over the scalp, left your hand and move to a new area, you can leave one hand kneading whilst moving the other to a new area - this continues a relaxing massage. Start at the nape, work forward, then back to the nape. The petrissage technique helps stimulate the muscles and glands along with improving blood circulation. Probably the most commonly used, friction is the quick, vigorous movements over the scalp. Start at the front of the head and work back, then bring the movements back to the front of the scalp. I would avoid using this technique on longer hair, but it works well on short to mid-length hair. How do you shampoo? Take your time or wash & go? And will you be giving the massage techniques a go next time you do? Haha tried the 'petrissage' technique, impossible!! Revision for my physiotherapy though haha thanks! !